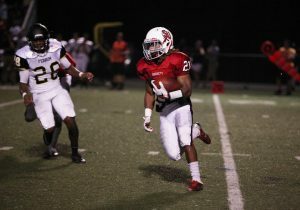 Coatesville Area Hgh School graduate Jalen Hudson in action for Shenandoah University. FOREST, Va. – Sophomore Jalen Hudson has been named the ODAC Player of the Week for offense in selections announced Sunday afternoon by the league office. Hudson helped Shenandoah to a 36-33 ODAC victory over Emory and Henry Saturday afternoon with a pair of long touchdowns to start the second half that completely changed the complexion of the contest. Trailing 20-13 to start the second half, Hudson took the second half kickoff and raced 87 yards down the SU sideline for the tying score. Two touches later, Hudson took a pass from classmate Hayden Bauserman and again outraced the Wasps defense for a 76-yard TD. That second touchdown gave SU a lead it would not relinquish. Hudson finished the game with 251 all-purpose yards, including 119 return yards, 76 receiving and 56 rushing. This is his first conference honor. Shenandoah is back in action next Saturday night in a 7 p.m. ODAC kickoff at Bridgewater.